Now that we have seen what are the functional aspects of Transportation Management delivered with the SAP S/4HANA 1709 release in the last blog, we will today dive into the technical aspects. With the 1709 release, we now have Transportation Management embedded in SAP S/4HANA based on feature scope contained in SAP TM 9.5 but focused on shippers. We provide system and process integration in SAP S/4HANA Enterprise Management, harmonize Business Partner, Locations and Product master data and provide user interface for SAP S/4HANA. Additionally, we can now work with real-time embedded analytics through the end to end process. 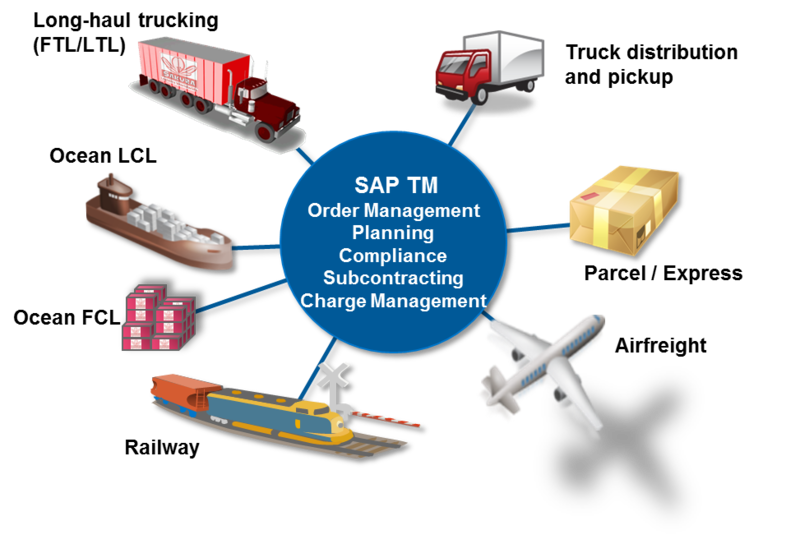 SAP Transportation Management embedded in SAP S/4HANA, offers modern transportation management to our customers, who want to leverage basic shipping functionality. The new deployment option also allows to run advanced transportation management processes embedded in SAP S/4HANA removing the necessity for costly data replication and additional hardware. Customer leveraging SAP TM in a hub scenario can of course continue to use the solution as “sidecar” as well. A few foundation aspects enable real time transparency over information. You can create and use the central master data for transportation related processes as well. By embedding transportation management, product master and business partner can now be directly read without effort of integration. Additionally, you can use transportation specific data like transportation networks (for e.g. location, transportation lanes and default routes). In the last blog I talked about automation and user experience. Let us deep dive further into the automation that bring effectiveness into the planning. The main key features are order based transportation planning with subsequent creation of deliveries based on the transportation plan and automatic planning(optimization). In planning, freight orders are created based on business documents, for example, forwarding orders. To do this, first freight units are created from the inbound business documents. Capacities are then assigned to these freight units. Various constraints are taken into account, for example, requested delivery dates. Freight orders are the result of the planning. You can use Manual planning or automate based on vehicle scheduling and routing (VSR) Optimization to generate optimized freight orders or you can generate multiple alternative transportation proposals for each freight unit and select the appropriate one. You initiate this from the interactive planning where you can assign freight units different capacities like Vehicle resources, Trailers (passive vehicle resource), Schedules or Freight bookings. You can also perform VSR optimization in the background. Planning strategies enable you to control whether the system is to select a carrier immediately after VSR optimization, for example. You can also use planning strategies to define the planning steps that the system is to perform and the sequence in which it is to perform them (via customizing). Each planning strategy comprises one or more methods that represent the individual planning steps. The aim of VSR optimization (VSR = vehicle scheduling and routing) is to assign freight units to capacities (for example, vehicle resources) in a cost-effective way while adhering to constraints, and to determine the sequence of deliveries and transportation dates/times. You can differentiate between hard and soft constraints. VSR optimization always adheres to hard constraints. You model soft constraints using penalty costs, for example, lateness costs that are part of the total costs. VSR optimization generates a transportation plan consisting of planned freight orders from the optimization data (freight units and capacities). When doing this, it processes freight orders already available from a previous VSR optimization run or manual planning. VSR optimization inserts the freight units step-by-step into the transportation plan. Then VSR optimization modifies these initial solutions step-by-step, for example, by loading a freight unit on to another capacity or by changing the delivery sequence of a capacity. When doing this, the optimizer tries to minimize the total costs while adhering to the constraints. At the end of the planning run, VSR optimization returns the best solution found. For example, if the costs defined for non-delivery of a freight unit are lower than the costs for transporting the freight unit, the freight unit is not delivered. Furthermore, you can generate multiple alternative transportation proposals, in other words, transportation plans, for each freight unit and can then choose to use one of them. With this level of automation, the empowered user can focus on really strategic decisions allowing the system to automate based on pre-set conditions. Finally, from a user experience perspective, the transportation cockpit enables you to trigger planning and provides interactive freight planning capabilities and status visibility. 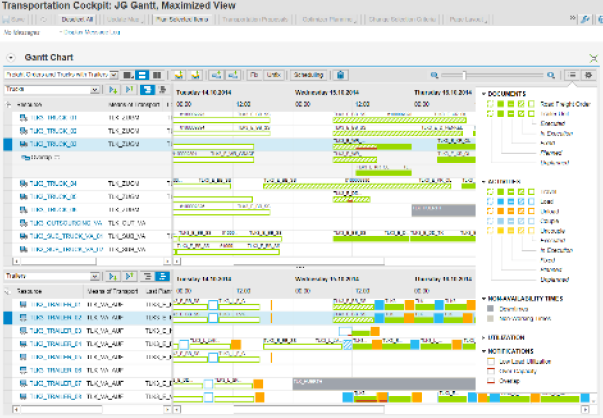 Additionally, Gantt chart provides a visual platform for performing interactive transportation planning and monitoring. Finally, embedded Transportation Management analytics are provided with Core Data Services in SAP S/4HANA 1709. What is the business value driven by this technology enablers? With this automation using advanced planning algorithms, we can ensure that shippers can now have a cost-effective planning while keeping constraints under check. The optimized generation of transportation planning ensures consistency, lower risk while at the same time keeping the flexibility by enabling modifications. This not only builds up the trust of the customer but takes the shipper to a new level of service delivery with real time and seamless end to end process assured throughout the buying and selling cycle of the customer. The flexibility in planning optimized ensures intelligent, data-driven process delivering a very cost effective cross country transportation capabilities that also ensure lower costs of holding inventory.